San Francisco is arguably the best food town in the country, which means pretty much every meal we eat is delicious and Instagram-worthy. Still, you know who else is eating and Instagramming those same meals? Everyone. 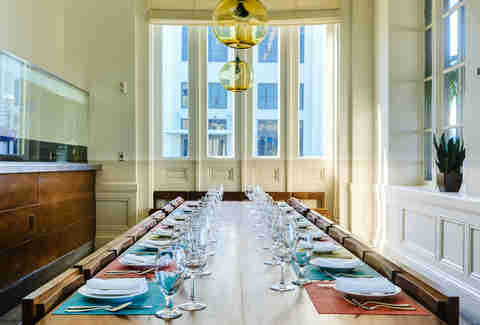 Just getting a table at SF’s best restaurants is no longer “enough” (you know what we mean) because now there are even cooler, more exclusive ways to eat. Whether you’re ordering off of a secret menu via social media or sitting at a hidden chef’s table, these privileged dining experiences are totally over-the-top and only for those in the know. Which, as of now, includes you. You’ll feel a little bit like you’re in Goodfellas when you show up for your chef’s table dinner reservation at One Market, and you (and up to six of your friends) are immediately whisked through the bustling dining room and into the expansive kitchen where you’ll be seated in a cozy leather booth with views of the Ferry Building clock tower. The menu is always changing, but may include indulgent fare like a bacon-wrapped pork tenderloin or pan-seared foie gras with seaweed, shiitake mushrooms, and duck-dashi consommé. 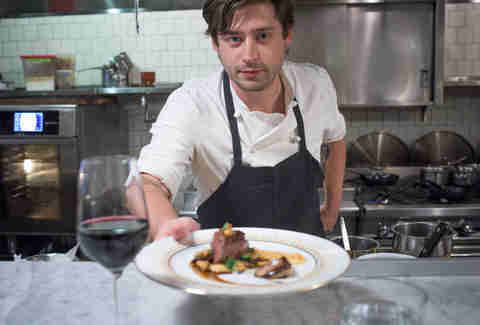 And each of the seven dishes is served by either Chef Mark Dommen or the cook who made it. 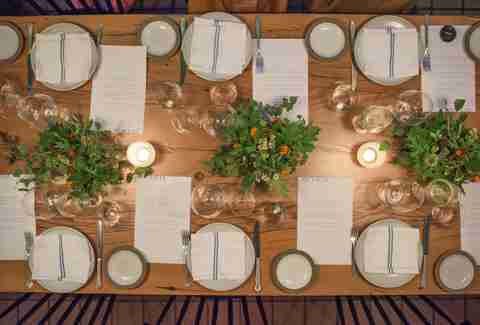 The dinner lasts about three and a half hours and is broken up by a tour of the kitchen, wine cellar, and even includes a participatory course where you’ll help prepare a dish. If you want (our group was all too full of wine and food and in no mental place to help). The price is $89 per person Monday through Thursday and $99 per person Friday and Saturday. Wine pairings are additional, but you might as well splurge, right? Call the restaurant at 415-777-5577 to make reservations. Chef Mike Lim of Roka Akor has a gorgeous Instagram where he shares pics of his colorful sashimi platters and high quality fish deliveries flown in from Japan. 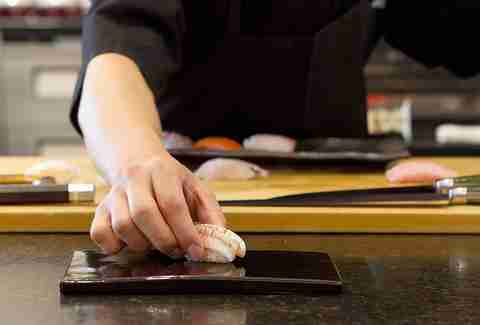 What you didn’t know -- until NOW -- is that as of March 1st, you can get a super secret off-the-menu sushi-specific Omakase tasting unlike any other in SF. Here’s the thing though: there will only be five of these offered each night and it’s only available Mondays through Wednesdays. Want in? Reservations have to be made a week in advance and you've got a good chance of getting one if you leave a comment on Mike’s Instagram and an even better chance if you comment on the Roka Akor SF account, @rokaakor_sf. We’re huge fans of Sous Beurre Kitchen’s regular menu, but we’re even bigger fans of the five-course tasting menu which is only offered at the six-seat chef’s counter on Friday and Saturday evenings. There are two seatings (6:30pm and 8:30pm), and you have the option to do a beverage pairing (small production French wines and vermouth-based cocktails), which, of course you’re going to do. The menu changes based on seasonality and the whim of Chef Michael Mauschbaugh, but your meal may include dishes like a savory onion tart with sweetbreads and celeriac custard, or poached goose breast with foie gras, madeira, cassoulet beans, and perigord truffles. And yes, knowing that you’re one of the only people in the restaurant indulging in such delicacies does make them taste that much better. Price: $85 per person. Beverage pairing is an additional $30 per person. 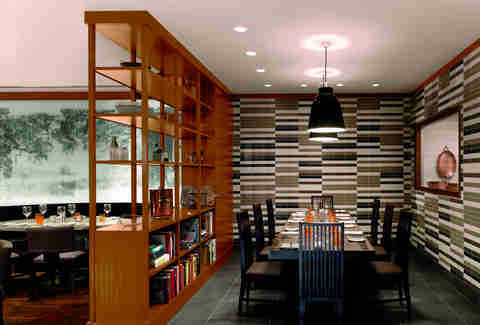 Call the restaurant at 415-874-9831 to make a reservation. 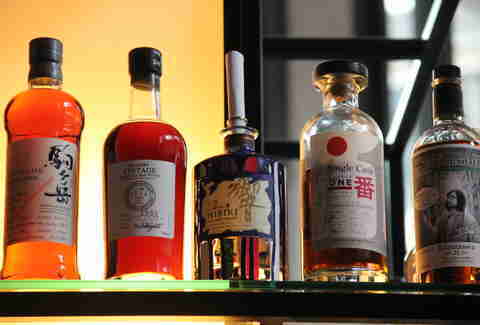 We’ve told you about the secret Japanese whisky cocktail menu at PABU before, but it bears repeating since there’s nothing more impressive than walking into a bar with friends, pointing to a random bottle behind the bar, and saying you’d like to order off of the piece of paper hidden inside. Do you like your exclusive dining experiences to come with Bay views? Then La Mar’s chef’s table -- Meson del Chef -- is definitely for you. The table seats up to 22 people, but don’t worry if you don’t have that many friends; you’ll just have to share it with strangers (who will be new friends by the end of the meal). There’s not usually a menu for this table, rather Chef Victoriano Lopez just sends out what he feels like... a Peruvian Omakase if you will. The best part? A lot of times, those dishes are things that have never been served before. All the better to Instagram! Call the restaurant at 415-397-8880 to make your reservation. You can order bubbles off of the regular wine list at 1760 or you can ask for the not-so-secret-anymore (oops!) reserve Champagne list only offered to those in the know. 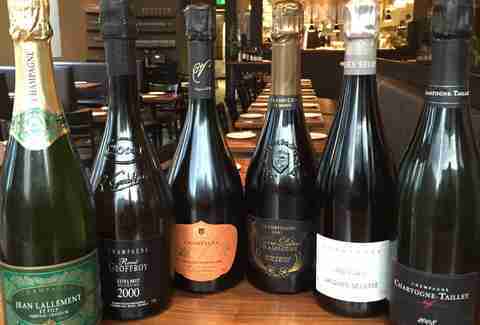 It’s probably one of the largest champagne menus in SF (behind Acquerello and RN74) and if you go on Mondays, you can get bottles for 20% off. 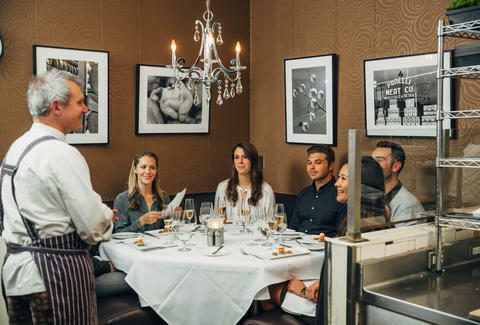 Parallel 37’s chef's table is tucked away in an intimate corner of the restaurant where you’ll get views of the dining room and a special tasting menu of globally inspired California cuisine created just for you by Chef Michael Rotondo. That’s pretty baller already (six courses runs $135 and eight courses is $165), but if you really want to throw down, you’ll opt for the Kitchen Table Experience ($250) where you start your night hanging in the kitchen sipping on cocktails and munching on canapés with the chef before dining on an eight-course tasting menu, complete with beverage pairings. Make a reservation by calling 415-773-6199. You’re going to need at least $1200 for this one, but considering Octavia’s chef’s table seats up to 12 people, it’s really kind of a steal. Plus, this is truly a one-of-a-kind experience as you’ll be seated smack dab in the middle of Octavia’s working kitchen and feast on a multi-course “Chef’s Choice” menu. Wine pairings are separate, but you’d figured that out already. For more information, email samantha@octavia-sf.com. Daisy Barringer is writer happily eating her way through SF. Follow her on Twitter @daisy.